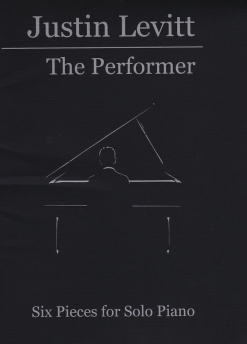 The Performer is Volume 7 in a series of solo piano songbooks by Bay Area pianist/composer Justin Levitt. Like the other books in the series, the pieces in The Performer were composed in a variety of styles that make up the category Levitt calls “Life Music.” What does “Life Music” mean or sound like? Well, basically, anything goes, giving Levitt the freedom to express himself in any way he chooses. Classical, pop, blues, ragtime, jazz, new age, Americana - they all become “Life Music” - and “Bravo!” to Justin Levitt for that! 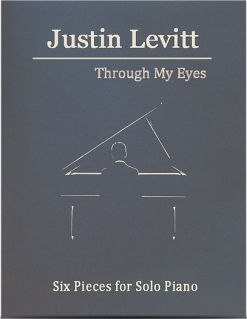 One of the surprises in this book is that, in keeping with the format of Volumes 1-6, Levitt subtitled the book “Six Pieces for Solo Piano,” but there are actually seven - a nice bonus! All of the books in the series are pure class - elegant without being stuffy. 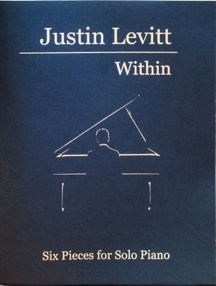 The distinctive and very minimal line drawing of Levitt playing the piano again graces the cover, this time printed with silver ink on a black textured paper - gorgeous! The book is in the 9”x12” format of classical music, has a stapled binding, and the scores are printed on a beautiful cream-colored paper stock. The book also includes a bio and note from Levitt as well as a description of each piece and the inspiration for it. At the end of the book, there are several quotes endorsing Levitt’s music. It’s a really nice package that I would think anyone would be proud to display (AND PLAY!) on his or her piano. The pieces are placed in the book from the easiest to the most difficult, and I would say the first piece is intermediate, and then it goes to upper-intermediate through early-advanced. All of the pieces have pedal markings, metronome settings, and plenty of dynamics. There are a few reaches of more than an octave, but not too many. Most of the rhythms are easy to count; there are a few small exceptions, but they do fall under the fingers once the pianist “gets” them. This music is very suitable for piano teachers and their students and would work with students of any age. Pianists looking for some contemporary solo piano with substance that is also fun to play, you’ve come to the right place! 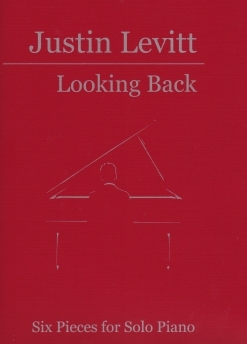 All eight of the books in the series are available from www.justinlevitt.com. Very highly recommended!